Visit Garden of Morning Calm, where over thousands of flowers are in bloom. Pretend you're in a Korean drama! Have a delicious and popular Korean meal for lunch: Chuncheon Dakgalbi (Stir-fried Chicken) with a halal alternative if required! 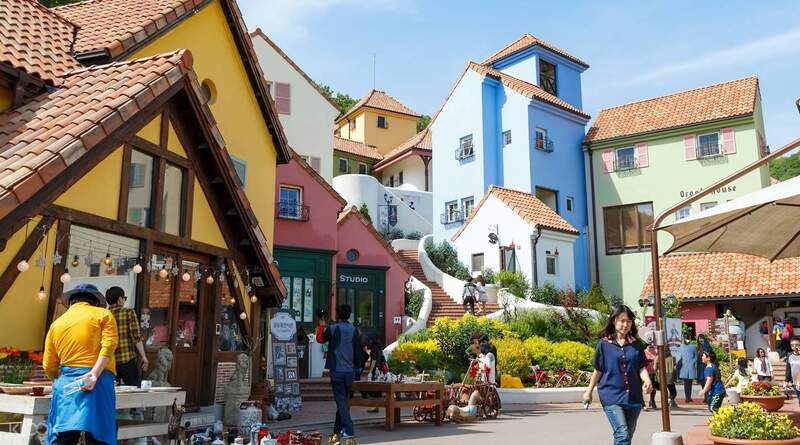 Escape the hustle and bustle of Seoul for one day and travel to the countryside of the Gangwon-do region. 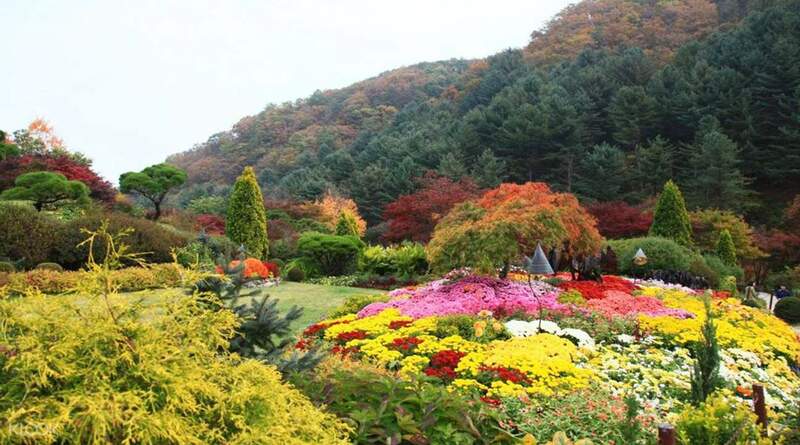 Be one with nature and experience South Korea's stunning natural wonders with this Nami Island day tour. It begins with transfers from Seoul at your chosen meeting spot, be it Hongdae, Myeongdong, Dongdaemun, or Seoul Station. Ride a comfortable bus to Petite France and pretend you're a character from the novel The Little Prince. Traverse through this quaint French-inspired park and check out statues and art created out of the famous book. Have a Chuncheon-style lunch with dak galbi (chicken cutlet and fried rice), which you can opt to have with cheese mixed with it! 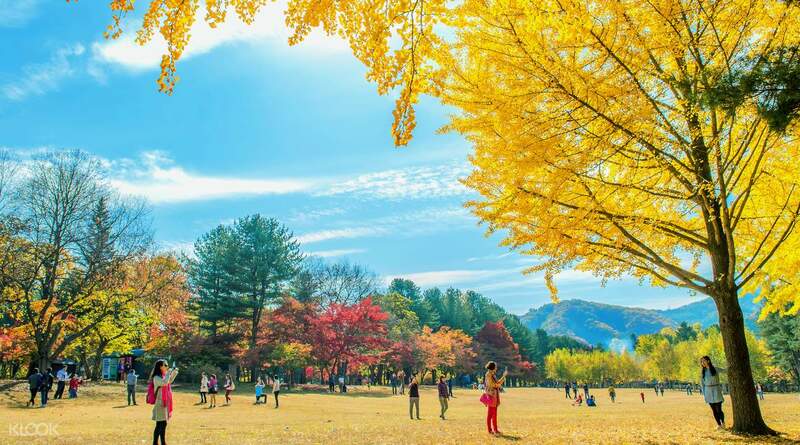 Then, head to the ever iconic Nami Island, where the Korean drama Winter Sonata was filmed, and take photos of the majestic trees around the area. You can also choose to stroll by the lake or ride bikes with your loved ones, enjoying the beautiful environment. 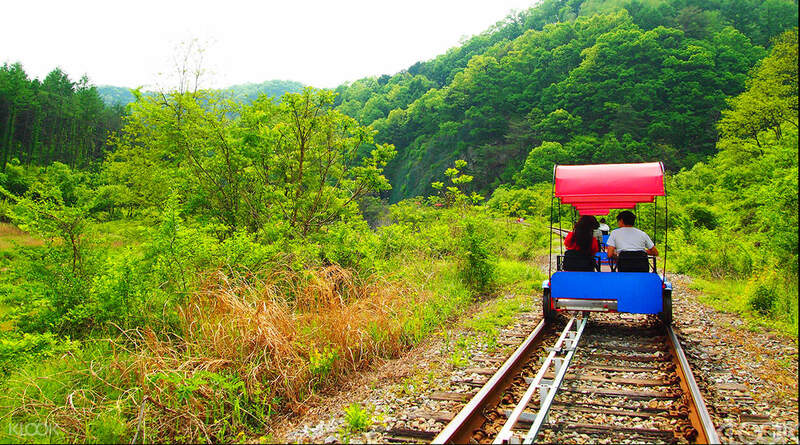 If you choose the package with a rail park ride, you'll be dropping by Gangchon Rail Park, where you'll pedal through old tracks while admiring the sceneries of the Gangwon-do province. Go through tunnels, ride beside lakes, fields, and more! Though it's tiring, it'll be well-worth the views you'll be seeing. Return to Seoul comfortably by the end of the day with the bus trip back to your original meeting spot. You'll see thousands of flowers in the Garden of Morning Calm; be captivated by all the blooms! The trip is lead by a tour guide Ms. Maple, she can speak Chinese and Korean very well. She is friendly and guide us to every places. She gives good advice and information too. Petite France is a very hapenning place and we enjoyed good shows there. We spent two hours there, it was good enough timing. Then, we went to rail park. We had great experience there. This is about another two hours spent there too. And we had a lunch on 130pm, four in a group sharing foods together. Foods were small portions but they allow us to refill rice and some side dishes. The last place is nami Island. Without waiting too long. We spent two hours in the island from 3pm to 5pm. And then we went back to myeongdong by 7pm. Overall is great. The trip is lead by a tour guide Ms. Maple, she can speak Chinese and Korean very well. She is friendly and guide us to every places. She gives good advice and information too. Petite France is a very hapenning place and we enjoyed good shows there. We spent two hours there, it was good enough timing. Then, we went to rail park. We had great experience there. This is about another two hours spent there too. And we had a lunch on 130pm, four in a group sharing foods together. Foods were small portions but they allow us to refill rice and some side dishes. The last place is nami Island. Without waiting too long. We spent two hours in the island from 3pm to 5pm. And then we went back to myeongdong by 7pm. Overall is great. shuttle came on time and the tour guide, Maple was so friendly and helpful. She speaks passable english and she was funny. But the weather was much colder than we expected. It was a great trip that we enjoyed very much. recommended! shuttle came on time and the tour guide, Maple was so friendly and helpful. She speaks passable english and she was funny. But the weather was much colder than we expected. It was a great trip that we enjoyed very much. recommended! Alex, our tourguide us nice and approachable. She smiles a lot. This trip is enjoyable and very convenient. We enjoyed Nami and Petite France. Garden of the morning calm is just so-so, or maybe because when we visited the flowers are not yet blooming. Alex, our tourguide us nice and approachable. She smiles a lot. This trip is enjoyable and very convenient. We enjoyed Nami and Petite France. Garden of the morning calm is just so-so, or maybe because when we visited the flowers are not yet blooming. Thank you to klook and SA tour. The travel agent and our tour guide are very superb. The young lady, maple was very friendly n helpful. Tour bus also on time, spacious and clean. The food provided by restaurant are delicious and have logo muslim friendly. Overall...fantastic one day trip with them. Thank you to klook and SA tour. The travel agent and our tour guide are very superb. The young lady, maple was very friendly n helpful. Tour bus also on time, spacious and clean. The food provided by restaurant are delicious and have logo muslim friendly. Overall...fantastic one day trip with them.